When creating your design, remember to consider the interplay between light and dark. A light colored backsplash with dark counters are a great way to use contrasting light and dark tones. A dark floor with light cabinets, or visa-versa is another way to achieve contrast. Playing with texture as a way of incorporating contrast can be fun considering how many natural stone, tile and cabinet options are available. The options are almost endless! Try mixing matte finish cabinet paint with glossy tile. 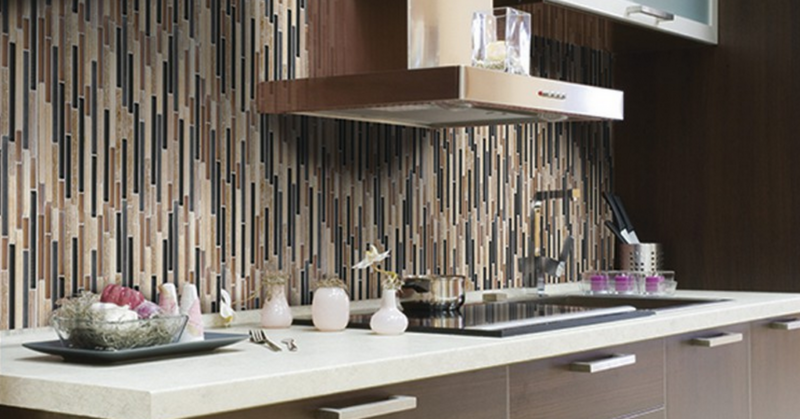 If you like a glossy modern cabinet door, think about a rough backsplash to add a little texture amid the gloss. Try using materials greatly contrasting, like a stainless steel refrigerator on a floor of reclaimed wood look tile. The texture play of sleek with rough will offer a big impact contrast. If you like cabinets with the woodgrain showing, try a solid surface counter with minimal texture variation to let the cabinets’ beautiful grain be a focal point. Or, try a solid color, simple cabinet with a bold granite texture. Contrast in pattern and material is important in a kitchen because if you have too many patterns and textures going on, it can look too busy. Let one surface take center stage and the other surfaces be the compliment. If you decorate with an eclectic style in your home, you can definitely play with style contrast in your kitchen design. You could create a country kitchen with modern touches, or a traditional-rustic style. A predominately contemporary kitchen with traditional touches could also be fun to explore. Pick your top favorite styles and start creating a vision board with finish and color options to create an eclectic kitchen with contrast and style. Even if you don’t consider yourself an eclectic decorator, using style variation in subtle ways can create a more interesting kitchen. Enjoy thinking about the many ways to use the powerful design principle of contrast in your next kitchen design! What is your favorite way to use contrast in kitchen design? Let us know in the comments—we love to hear from you!